I came across these postcards while I was looking for some photographs. They belonged to my Grandmother and she collected them in the early 1920s. They were made in the US by Reithal A Newman Pubs, NY. 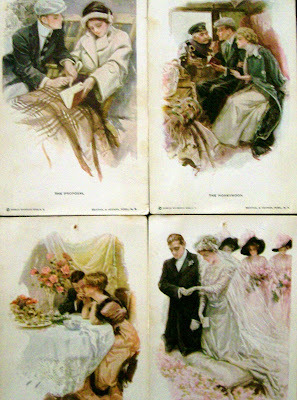 The cards are called The Proposal, The Wedding, The Honeymoon and the First Evening in their own Home. I loved my grandmother and I loved listening to what her life was like as the oldest of 14 children. I was lucky to have spent a lot of time with her. She was a true friend. Funny enough she was not like the shy, retiring ladies on these cards. She worked hard, alongside her husband on a farm. My memories of her were of a happy woman who spent her days picking grapes, milking cows, feeding chickens, cleaning eggs and preparing beautiful and bountiful spreads for family and friends. She was a pioneer in many ways. Sometimes in understanding where we come from we can better understand where we are now. I feel a great need to go back to basics again in my life. I wish my grandmother was still here. Looking at these cards makes me miss her all the more. Be open to learn the lessons about life and love from your parents and grandparents because one day it will mean something when you least expect it. You don't get a second chance. 'The Bygone Era' - Hmm...It reminds me of my granny - She is always so good. Women of that age were so different than todays. I dont mean to hurt anyone but they were just so lovely in their methods and ways. They never raised their voices, never hurt anyoone and never used to get divorced.